Weddings, first and foremost, are personal events. This is why many soon-to-wed couples make sure that their weddings are very personalized, incorporating bits and pieces of themselves that reflect who they are and, in a way, tell their story. For television host Lovella ‘Love’ Añover and husband Jomar Lianko, their wedding was one whole interesting story worth telling. And how! Love, as known by many, is a popular morning TV show host. Jomar, on the other hand, is part of the information technology (IT) department of a local bank. The two met each other in the only place where their two different worlds would likely meet – the Internet. Just like many Filipinos, both maintained an account in the social networking site Friendster. Jomar added Love as a friend out of curiosity. Love, thinking that he was a regular viewer of the show, confirmed the invitation. Jomar sent a message to Love asking if it was really her and not one of those poser accounts. Love replied saying that it was, indeed, her. From then on, they exchanged messages online and got to know each other better. After six months of online communication, Love finally agreed to entertain Jomar’s invitation to meet, see each other in person, and watch a movie. Their first meeting was in August 2007 and it was not a date, as both explained. It was simply a meet-up. “Was it love at first sight? No,” said Love. In fact, it was nothing both expected it to be. Love complained to Jomar about his ‘bad driving skills,’ he however was being an ‘alaskador’ (teaser). Despite this, they began going out together with their circle of friends. Their constant meet-ups soon developed into something more as they grew fonder of each other, a fondness that would develop to a mutual understanding. On August 29, 2008. the two officially became a couple. To celebrate Jomar’s birthday on February 14, Valentine’s Day, he and Love, being adventure- and nature-lovers, booked a trip to Sagada in the Mountain Province. (Un)fortunately, no one was able to join the two in their trip. Since they would be celebrating his birthday there, she planned a surprise for her boyfriend. Little did Love know that she was the one who was to receive the biggest surprise of her life. One week before the Sagada trip, Jomar was already thinking of proposing to his girlfriend; he just didn’t know how. 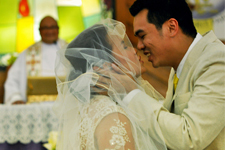 On February 21, 2010, Love and Jomar said their “I Do’s” at their chosen wedding ceremony venue, the Holy Spirit Parish in Quezon City, where they often attend mass. 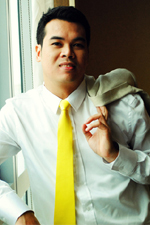 Showbiz reporter Nelson Canlas, who had some experience in wedding planning, volunteered to be their wedding coordinator and composed a song which told their love story. This song was then used for the bridal march. To incorporate their love for dining and eating out, their invitation was customized to look like a restaurant menu. 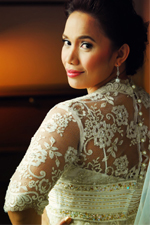 During their wedding day, their chosen motif was white and yellow, Love’s favorite color. When the ceremony was over, the two rode out in their own car with their mountain bikes attached to it. Theirs was a garden wedding, with the reception venue adorned with bonsai, indoor plants, and of course, calla lilies (the latter reminiscent of their Sagada trip). Their wedding cake resembled a falls to remember where Jomar proposed to Love. “We wanted everything to be personal…. may connect sa amin lahat [and has a connection with us], said Love. And indeed, every inch of their lovely wedding represented a part of their story and their dreams for their new life together. What better way to make their most important occasion more memorable?